Advantage-Fb 1700 Visco Mattress: Viscoelastic Memory Foam Is The Standard For Comfort And Durability. Our Advantage-Fb 1700 Visco Features An Anatomically Zoned Design, Which Allows The Mattress To Cushion Bony Prominences With Incredibly Low Interface Pressures. Two Inches Of Viscoelastic Foam (Four Inches In The Heel!) Provides Outstanding Comfort And Pressure Reduction. A Sculpted Center Layer Adds Air Channels Designed To Allow Horizontal Airflow And Reduce Moisture And Heat Buildup.Beginning July 1, 2007, All Mattresses Must Comply With The New Standard For The Flammability Of Mattress Sets (16 Cfr Part 1633). Additionally, Nfpa 101 Life Safety Code, Joint Commission And Cms Requirements Can Demand Compliance With Astm E 1590.Medline'S Advantage-Fb Mattresses With Integrity30 Fire Barrier Fabric Are Certified To Meet Full-Scale Testing, Including Cal Tb 603, Cal Tb 129, Astm E 1590, Bfd Ix-11 And 16 Cfr Part 1633. 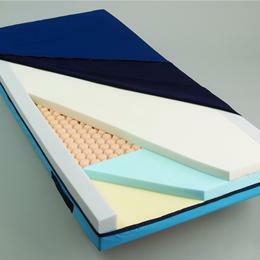 All Foam Components Used In Medline Mattresses Featured On This Page Meet Or Exceed Cal Tb 117. In Addition, All Mattresses Featured Pass The "Cigarette Test" (16 Cfr Part 1632). It Is Each Facility'S Responsibility To Determine Compliance Requirements For Their Mattress Purchases. 36" X 80" X 6".